A Holocaust survivor appealed to Polish authorities to “take radical measures” in the fight against neo-Nazi organizations in Poland. Magdalena Wyszyńska, 96, a Polish Jew from Lviv, on Saturday spoke during an anti-fascist counter demonstration organized by the mayor of Gdańsk, Paweł Adamowicz. The counter demonstration, joined by 1,500 people, was in response to a march in the same city last week by extreme right-wing groups. “History is not repeating. History often returns as something much worse,” said Adamowicz during the event. He said history should serve as a warning and a lesson. “It turns out, however, that for many of our countrymen it is not analyzed. 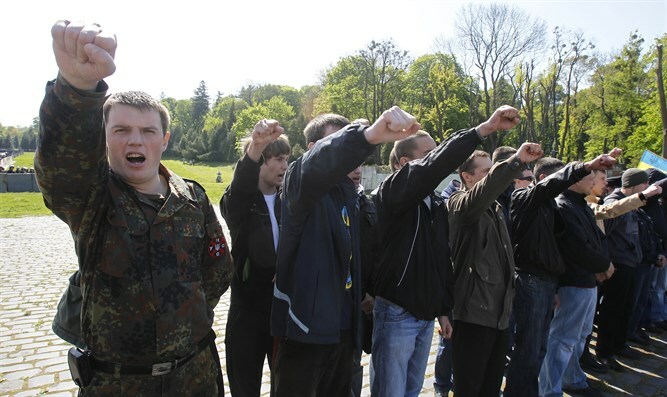 They dress in costumes of nationalist and fascist organizations. Organizations that were anti-Semitic and full of hate,” he said. “I would like future generations to not know this horror. I hope that this will go to the hearts of the appropriate bodies, regardless of religion, and will encourage them to take radical measures,” she said. On Saturday, the Internal Security Agency and the police carried out a raid in Dzierżoniów, in southwestern Poland, to detain people associated with the neo-Nazi community and prevent a nationalist concert, that was timed to coincide with Adolf Hitler’s birthday. Areas of the town were paralyzed for several hours, and police did not allow residents to leave their homes. It was feared that neo-Nazis could be armed and pose serious danger.